The class of 2016 at Coatesville Area Senior High School graduated under bright, sunny skies at the 138th commencement Thursday. 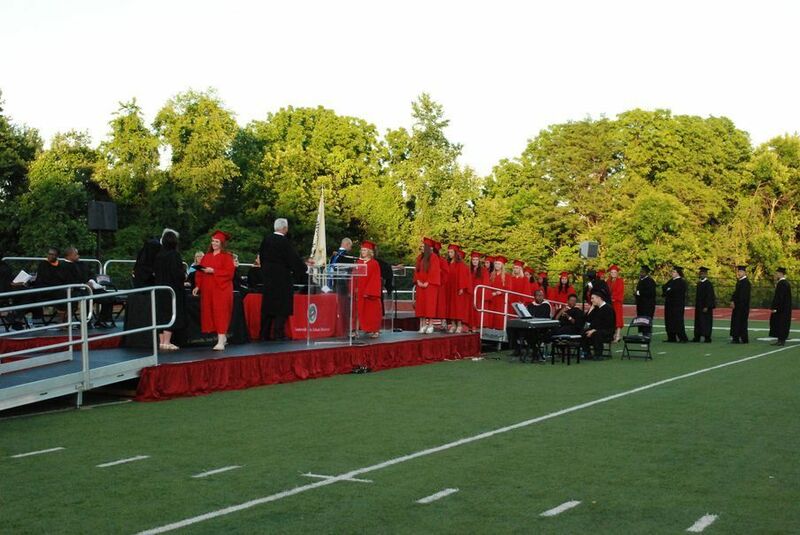 CALN – The Coatesville Area Senior High School held its 138th commencement under perfectly bright, sunny skies at the Coatesville Memorial Stadium – Red Raider Field Thursday evening. As is tradition, the graduating class of 2016 assembled in the 9/10 center gymnasium and were led in a procession by 10th grade social studies teacher Jason Eckert, who was voted as educator of the year by the honor society. The procession went from the 9/10 center and around the senior high school for one final look at the building, before entering the stadium to the traditional pomp and circumstance. Led by Superintendent Dr. Cathy Taschner and school board president Dean Snyder, the seniors were congratulated by teachers, guidance counselors and staff that lined the path into the stadium with hugs and hand shakes. As they crossed the field past school administrators, their family and friends who filled both the home and visitors’ stands, clapped and cheered for the graduates. 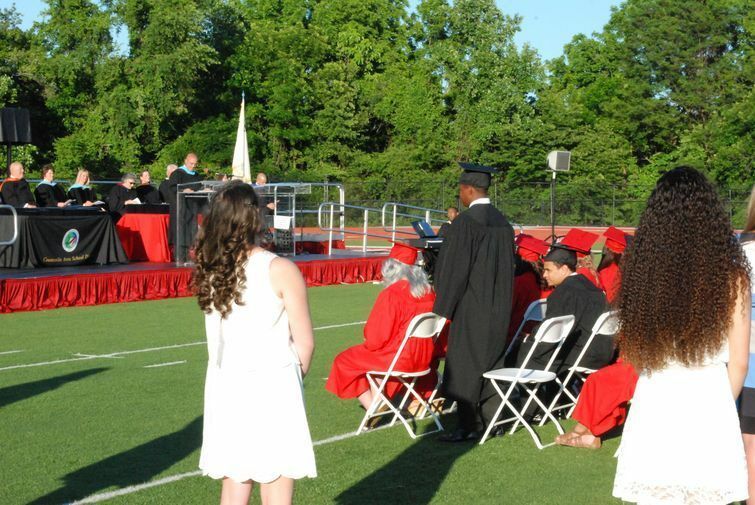 “It was an honor to celebrate the collective educational efforts of students, teachers, administrators, and support staff at the 138th Commencement of the Coatesville Area School District. The commencement speeches from valedictorian Melissa Ling, and senior commencement speaker Daniel Voorhees were evidence of the outstanding accomplishments of our students and staff,” Taschner said in an email. 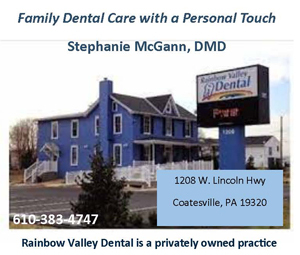 “While each of our 459 graduates have different dreams and aspirations, and as we send them to off to various universities and colleges such as: Lehigh University, Penn State University, Old Dominion University, Purdue University, Temple University and Lebanon Valley College — they will always share a common bond as proud alumni of the Coatesville Area School District.” Taschner continued. Robert Fisher, supervisor of campus principals and programs, recognized senior R.J. Miller for being a daily inspiration to him because of his positive outlook, outgoing personality and for always smiling. Robert Fisher, supervisor of campus principals and programs, thanked the students for their involvement in school and took the opportunity to recognize a student, R.J. Miller. Miller, said Fisher, always had a positive attitude, a big smile, and has been an inspiration to him and to his classmates, as they demonstrated by voting him homecoming king this past fall. This was the last commencement Fisher was to attend as an administrator of the district, as he is officially retiring July 1.